Ultimately, 'Silent Films, 1877-1996: A Critical Guide To 646 Movies' (hereafter the slightly less wordy Silent Films, 1877-1996) is a fascinating book, and one that is of use to anyone with an interest in silent films. It is also one of those books that one immediately picks up in order to go through it with indecent brevity looking for reviews of the films one has seen recently in order to evaluate the author (in this case Klepper)'s opinions. Then, one either nods in tacit agreement with what is there or shakes one's head in disbelief that the author has made a faux pas and mis-read what one has always felt to be a classic as a total turkey. Thus it is that such books are always interesting, and seldom without controversy. The sheer scale of Silent Films, 1877-1996 is to be commended- there are indeed 646 films referenced, ranging from Muybridge's Woman Hopping On One Foot (circa. 1885) to the equally less well-known The Taxi Dancer (1996) but including most titles one would expect along the way. Intriguingly, Klepper adds to his prose analysis a star rating (once the mainstay of a plethora of home video guides in the 1980s), which adds an uneasy edge to some of his comments. Thus, most well-known films receive the customary four star treatment, but some suffer a lesser fate, being relegated to mere 'also-rans'. One of the films Klepper has no time for is, amazingly, Nosferatu (Murnau, 1922). This groundbreaking film is reduced to a two-star rating ("fair"), and its "narrative style is rather poor" (p.343), whatever that may mean. It is such swift dismissals that place Klepper's well-researched book in academic jeopardy, as he does not have the space to conduct a well-structured argument. The result of some of his comments is, therefore, to instill a negative reaction in the reader, who can see problems not in the very films under criticism but in Klepper's handling of his outlook towards them. Other films to receive the Klepper vote of no confidence are the Chaplin classic The Gold Rush, Clarence Brown's marvellous Flesh And The Devil and Rene Clair's The Italian Straw Hat (of which Klepper says 'if this is Clair's best work, he has obviously been overrated as a director' (p.524). It is such a comment that, quite apart from his absurd first form classification system, that makes Klepper's book, for all its hard work, suffer. Overall, Silent Films, 1877-1996 is a very well researched and documented history of silent cinema, and its vast scope (beyond many more widely-circulating film guides of its type) makes it a sensible purchase for the discerning silent film fan. However, it is well to bring one's own judgement to the fore together with the wisdom one accumulates as time goes by. Thus, the still of Laurel and Hardy that accompanies Klepper's review of The Battle of the Century on page 558 is, in fact, from the much later Way Out West, for example, strengthening the prevailing mood- that the book should be taken with a very visible pinch of salt. These comments made, the upshot of Klepper's book is to raise the profile of certain films (the still largely unseen Noah's Ark, which Klepper calls "one of the most grossly underrated films in motion picture history", p.616 being a key example). If opening eyes in this way is to be the book's ultimate achievement, it is an achievement of which it (and its late author) can feel justly proud. No, Silent Films, 1877-1996 is not "the" book on silent cinema, but that has yet to be written. Instead, Klepper's work should be used in conjunction with other silent film books to inform, to educate, and, above all, to inspire. 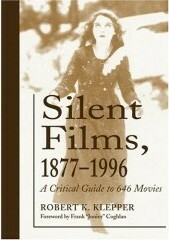 'Silent Films, 1877-1996: A Critical Guide To 646 Movies' is published by McFarland & Company.